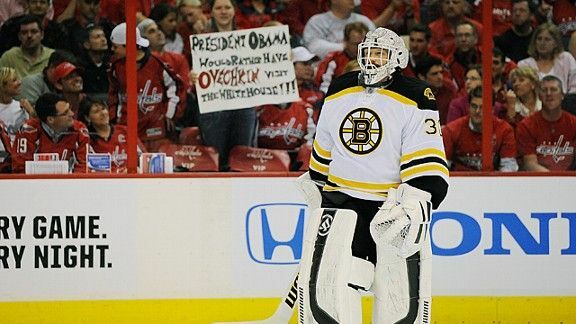 Man, is there a better way to respond to that Tim Thomas White House kerfuffle than holding a giant Obama head behind the net? Nope. There is not. Fast-forward to Game 3 on Monday night, when Thomas was met with giant Obama signs at the Verizon Center. Look, I don’t really want to be all political here, so whatever. You do you, Tim Thomas. And I guess it didn’t work, since the Caps lost. But I think we can still all get behind some clever signage, right? Bravo, Caps fans! We really enjoyed your posters! (This is my favorite.) And we look forward to seeing the dialogue in our nation’s capital return to more important topics, like Mitt Romney’s dog and whether Hilary Rosen said something offensive about ladies. You can see a full slideshow over at Puck Daddy, and also make sure to check out the Washington Post and Washington Times for additional trolling coverage. 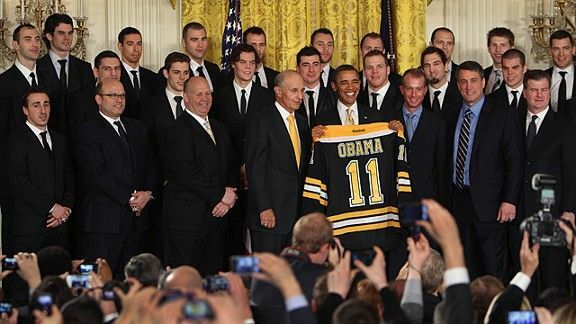 Obama pics behind Tim Thomas with Caps Fans yelling Yes We Can is the 2nd Best Hockey Highlight of the night……. RANGERS!! !